Kofi Annan, the first black African to lead the United Nations, died today after a short illness at the age of 80. 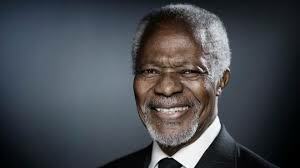 Annan, who was born in Ghana in 1938, served as the UN's seventh SG from 1997 to 2006 and was, as CNN notes, the "first to rise from within the ranks of the United Nations staff." He won the Nobel Peace Prize in 2001 for his humanitarian work at the UN. He spent his post-UN years as a champion for peace, establishing the Kofi Annan Foundation, which "mobilises political will to overcome threats to peace, development and human rights." The Foundation home page noted that he passed away "peacefully" and that "wife Nane and their children Ama, Kojo and Nina were by his side during his last days." In southern Africa, Annan made an official visit to Mozambique in 2002, and "hailed the country's progress as a model for others emerging from war."